My first shareware assignment for FS Planet was bound to make me slightly excited but when I decided to contact Ariane Studios regarding the review I could only get more excited. Before I’d even looked at the aircraft I was impressed with the latest in the small collection of shareware developers. Before I go on I would like to say a special thank you to Bob Hale, one of the Ariane team for his efforts towards getting the aircraft to me. Amongst all the problems he already had, he tried his hardest and I cannot fault the team for that. But what about the aircraft? The prospect of reviewing this wonderful new aircraft had kept me up for two late nights just flying her about and admiring the tremendous amount that Bob and all his team put into each of the liveries on sale. When I first did my research on the product I thought that the price of £7.50 was a lot to pay for such an aircraft. How wrong I was, expensive? Yes. Worth it? Absolutely. On first inspection of the aircraft I was simply quite take back by the superb quality of the texturing on the aircraft. The photo-realistic quality is second to none. The shine and glimmer from parts of the aircraft such as the engines and the nose make the aircraft look that little bit more real and make the Ariane products stand out from the others. The other great fact about these textures is that the standard is the same for all the liveries available on the 737-300. British Airways, United, Lufthansa and Quantas all featured in the collection. For more aircraft liveries, exclusive Ariane Studios news, updates and of course new products visit the official site via the link provided at the bottom of this page. The model of the aircraft is equally impressive. A new innovative feature is also part of the product. A full working hydraulic suspension system on all sets of wheels looks absolutely fantastic. The aircraft also boasts a superbly animated reverse thrust system and very impressive control surface animations on all areas of this first ever shareware Boeing 737-300. Close up details like the landing gear complexity and the craftsmanship involved in the design of cockpit area mean that this product from Ariane Studios is one of the most realistic looking aircraft available to date. There is one more issue on the model I have not looked at yet, flaps and spoilers. If someone asked me to sum up the detailing on the flap and air brake system, that one word would have to be “wow!” In all truth I do believe that the flaps seen on this aircraft are better than anything ever seen before. Fully animated slats also accompany the super realistic flap system. Flying the aircraft is as you would expect, like flying a 737-300. I am not an expert on air files and the exact degree of realism in aircraft for Flight Simulator. This aircraft however, is very nice to fly. I have not been able to put down my favourite, the British Airways variation, ever since I got into its virtual cockpit for the first time just a few days ago. This aircraft is well worth every penny you pay for it. 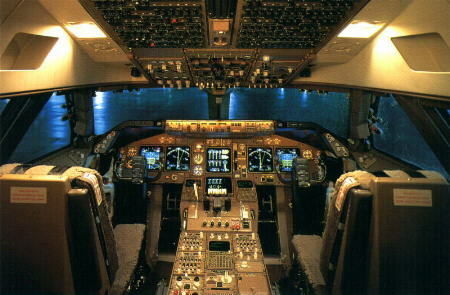 All in all the aircraft has to go down in the Flight Simulator history books as one of the best visual models ever. I only speak the truth and if you have got £7.50 its well worth buying it and taking it out for a spin around you local large airport. You will not be disappointed at all. Still in doubt? 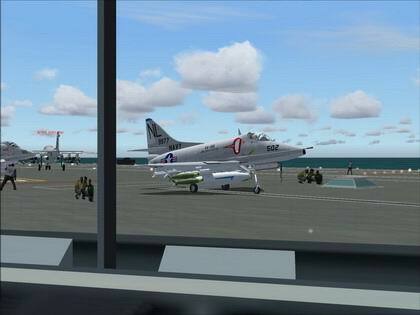 Check out our screenshots for a further look at these wonderful aircraft. Special thanks to those who provided the aircraft for my review. It would not have been possible without your help.